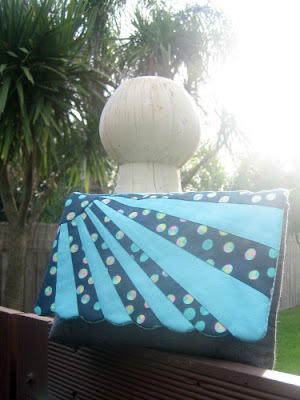 Last month I decided it was about time I made me a bag and I’d been eyeing off the new Sunburst Clutch pattern by Mrs H and Pennydog Patchwork which had just been released. Now this clutch is a collaboration of paper piecing and bag making and is a perfect introduction to both. The paper piecing is fairly straight forward with easy to follow instructions and photos. If you’ve been wanting to try it this is a great place to start unlike me who went head first into the koala. I really liked that there was a list of instructions at the end to print so you don’t need to waste paper. I often like the photos to be in colour but only print in black and white so I’ll have the ipad or phone next to me to see the picture if I get stuck. All the instructions are very detailed with great photos to match. I decided to add some Soft & Stable foam to my bag body. This was the first time using it and I have to say I absolutely love it. It’s still flexible in the bag but just adds that bit more structure than the fleece. I also left off the interfacing as I didn’t know how structured it would be however next time I will probably use it with the foam. Now back to the flap. Scallops, these are the fiddly part of the whole pattern so I think that’s a win. I don’t sew a lot of little curves so I took this step extra slowly. I wanted to get them as round as possible. I followed the lines on the pattern to help this. I then carefully cut my fleece to match the scallops before attaching and I think they turned out alright. But you know what they say – practice makes perfect so I may just need to make a few more right. I really enjoyed making this pattern. 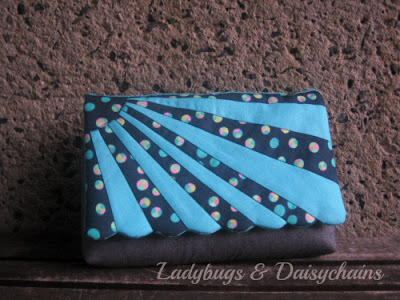 How pretty does my new Sunburst Clutch look! It is the perfect size to take out to dinner and still carry everything you need while out. You can buy the pattern here. This entry was posted in Amy, review on June 15, 2015 by Amy.